The Palouse is so naturally photogenic, anyone with a camera can capture many beautiful landscapes, rustic barns, old homesteads, funky old trucks, and picture-perfect postcard scenes with relative ease. A drive down any of its backroads affords innumerable opportunities for stopping and shooting. But the fact is, photographers love tinkering with their images. Some are happy to boost the saturation, tweak the brightness or contrast, or alter the hue a bit to make the picture reflect the best version of the scene as they remembered it. But with so many excellent post-processing tools on the market, many of them quite affordable (or even free, as Google made their NIK collection last year), opportunities for creative expression are seemingly boundless. I belong to several photography groups on Facebook, where I see all kinds of marvelous images others have taken of this place I call home, including some that would have been impossible to create apart from Photoshop. Need a full moon to complete your landscape, only there’s no full moon on the horizon? No problem. Grab a full moon you captured in a different place and time and drop it into your landscape. Voila! Some photographers disdain the use of post-processing; others embrace it to an extreme. In my view, it’s the artist’s call entirely. I think it’s fun to see how many variations of an identical scene emerge from the cameras and minds of different photographers…or from a single photographer experimenting with available tools. 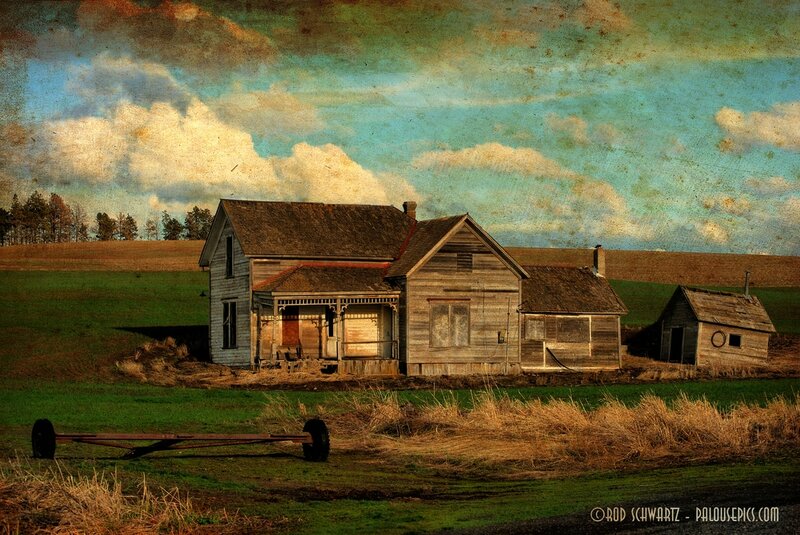 The subject here is the old Weber homestead below Bald Butte, near the tiny town of Johnson, Washington. I snapped scores of shots from various perspectives, using a variety of lenses, one day in April 2009. Here are just a few of the endless variations on a theme that can be created with just a click or two. If you’re planning a trip to the Palouse, be sure to stop by the Pullman Chamber of Commerce and pick up a copy of their excellent brochure, Photographing the Palouse. Use the map to plot your picture-taking excursions and once you’ve created masterpieces of your own, share them on the Chamber’s Picture-Perfect Palouse Facebook page. Good shooting!